I know about the prior four Revolutionary War Veterans buried in Logan County, Illinois, because I descend from all of them. There is at least one more and possibly three more. One is Henry Kimes. According to an early work on Illinois veteran burials, he was born in Chester County, Pennsylvania, and served in the Chester County Militia in 1780, 1781 and 1782. It says he went to Logan County, died and “is buried near Lincoln.” Actually he is buried in Atlanta Cemetery. I have seen a photo of his stone. I have never run across a descendant. Source given for the information is Pennsylvania Archives. Finally there is William Patterson. There have been various references to his Revolutionary War service. I have talked to descendants looking into a DAR membership based upon his service. I have not seen their research. He was born in Virginia in 1757. His first child was born in Botetourt County. We know he was in Ohio by 1809 when his son Thomas married there. From Madison County, Ohio, he came to Logan County with his son Moses before 1840. He died March 16, 1840. I know more about him because one of his sons married Elizabeth Morrow, a daughter of James Morrow and Hannah Downing. A daughter married a William Frakes, brother of Hannah Frakes who married John Downing. These people are from the Downing line which is buried at Bowers-Templeman. For some reason, William Patterson was buried in Downing Cemetery, final resting place of the other Downing line. 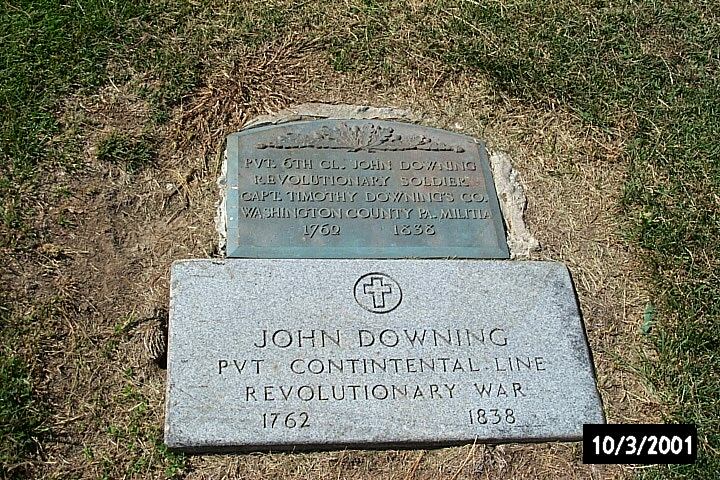 John Downing was born about 1762 in Maryland. Thanks to DNA testing we know he saw service in the Washington County, Maryland, militia. He was a Private, 5th Class, in Capt. Basil Williams Company, 2nd Battalion, in 1778. For many years he was believed to have served in Pennsylvania. See John Downing’s Elusive Service. As far as we know, he did not apply for a pension which is part of the reason his service was elusive. As a result we don’t have a written version of his travels across the country. We know in 1783 he was living in Marsh Hundred, Washington County, Maryland. By 1786 he was living in Hopewell Township, Bedford County, Pennsylvania. In 1790 he is on the first federal census there. By 1808 he was in Jefferson Township, Monroe County, Ohio. A history of Madison County says he was “a native of Virginia.” It also tells us that in 1822 he moved to Logan County. In another error, it places Logan County in Ohio. On August 6, 1831, he purchased 80 acres of federal land in Chester Township. John Downing and his wife Hannah Frakes had eight children, seven of whom survived childhood. Three served in the War of 1812 while they lived in Ohio. One died in battle and one died not long after returning home. The third died in Logan County at the age of 94. Another son continued on to Iowa and another eventually went to Kansas. A daughter married and left for Oregon but got delayed in Kansas. Another daughter died in Logan County before her father. Downing died on December 18, 1838, in Salt Creek Precinct, Sangamon now Logan County, Illinois. Less than two months later Logan County was officially formed. There were various early courthouses but the final one is in Lincoln. Almost immediately after all files were transferred to the new courthouse it burnt. There is no probate file nor any other records. Unlike James Turley and Humphrey Scroggin, we know exactly where he is buried – in Bowers Templeman Cemetery. Originally, John got a Revolutionary War marker based upon his service in the company of Capt. James Scott, 3rd Battalion, Washington County Militia, Pennsylvania. He was a private 5th Class and can be found listed in the Pennsylvania Archives. DAR agreed. Later John and his extended family and friends traveled to Ohio and on to Sangamon now Logan County, Illinois. They even brought along James Scott. Then it was determined that was not the right service for this John Downing. Nope. His service was in Capt. Timothy Downing’s Company, Washington County, Pennsylvania, militia. At least the location was correct. And probably the two Johns are related. A new marker was added to the old on at Bowers Templeman Cemetery just north of Salt Creek. The DAR participated in the ceremonies. That was 1977. Then the DAR decided that wasn’t correct either. And the timing really was off. After the war John moved back east in Pennsylvania instead of continuing on west? That could not be explained. Recently, DNA testing allowed Mary Lou Cole of Ohio to follow a theory. John Downing didn’t serve in Washington County, Pennsylvania, but Washington County, Maryland. Mary Lou is not a descendant of this particular Downing line but she was determined. There were naysayers, including me. She continued on. On September 5, 2013, the DAR notified Mary Lou that they agree with her conclusions (and documentation of course) and John Downing is now officially recognized as having his Revolutionary War service in Maryland. John Downing has three stones. He has his original, which goes with the stone of his wife Hannah, to go with the two in the photo. Will he get a fourth, this time with the correct service?